Our store was started by Steve Rosen way back in 1999 - over 14 years ago! 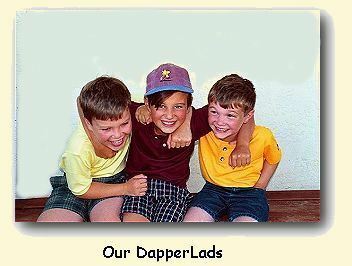 The kids in the picture to the left are his "DapperLads" (his 3 boys) - his wife, Becky, started an online store about the same time ( DapperLads ), selling boys clothing. But Steve enjoyed birds and bird-watching and turned his interest into a successful website, catering to others that are interested and active in this most rewarding of hobbies! We offer the best selection of quality products you'll find anywhere. If you're looking for a wide assortment of items at great prices, you've come to the right place. You'll find an abundance of exciting options to choose from at Bird Central , and our checkout process is quick, safe, and secure. When it comes to providing the customer with just the right thing, we're the experts. We work closely with manufacturers to bring you a variety of unique choices, at prices that fit every budget. You don't have to travel from store to store looking for what you need. You're certain to find great products, great value, and great service at Bird Central . When you place your order today, you'll get your item quickly, so you can enjoy it as soon as possible. We understand that shipping costs can be an issue when it comes to the items we sell. That's why we offer low-cost Standard Shipping (Ground) delivery on every item we stock. Or, if you need your package faster, we also offer Expedited Shipping delivery. Plus, we offer no-hassle returns - your satisfaction is guaranteed. To contact us, send us an email - we strive to answer your e-mail within 24 hours. Enjoy safe, secure shopping. Bird Central uses a safe and secure online ordering system that protects your privacy every step of the way. Plus, Bird Central is thawte SSL Certified, meaning we offer secure communications by encrypting all your data. We work hard to provide you with a great shopping experience at Bird Central , and we're confident you'll enjoy the product you purchase. After all, that's why we're here.